Identification of modifiable risk factors for stroke may lead to more effective prevention of cerebrovascular diseases. Elevated serum homocysteine (Hcy) has been associated with an increased risk of atherothrombotic disease. ,, Whether this association is causal or not remains uncertain. Experimental evidence suggests that the atherogenic propensity associated with hyperhomocysteinemia results from endothelial dysfunction and injury followed by platelet activation and thrombus formation. , Carotid Doppler is a non-invasive technique in evaluating the patency of carotid artery and carotid intima-medial thickness (CIMT) is commonly used as a surrogate marker for atherosclerosis. Atherosclerotic plaque is initially revealed sonographically by an increase in the combined thickness of the intima and media layers. In the general population, a weak association has been reported between Hcy and CIMT. One Japanese study however found an association between plasma Hcy levels and carotid intimal thickening in normal individuals. However in patients with atherothrombotic stroke, no significant correlation was found between these two variables. This study was undertaken to investigate the correlation between hyperhomocysteinemia and the degree of CIMT in stroke patients. After getting approval from the institutional review board, we undertook a prospective cross-sectional analysis of 100 consecutive patients who were newly diagnosed to have acute anterior circulation stroke at St. John's Medical College, Bangalore, India from September 2008 to September 2010. Major exclusion criteria included factors that are known to influence Hcy levels like renal failure, thyroid disease, pregnancy, hepatic failure, and treatment with drugs like antiepileptics, fibrates, hormone replacement therapy, folate, vitamin B12, and vitamin B6. All patients underwent a detailed evaluation, which included a detailed history and physical examination. In all cases, the diagnosis of ischemic stroke was confirmed by neuroimaging of the brain. Fasting serum samples for Hcy were sent within 24 hours of admission. Serum Hcy level was estimated by the microplate enzyme immune assay technique. All patients underwent a carotid Doppler scan and CIMT was estimated on both sides at the free wall of the common carotid artery, internal carotid artery or the carotid bulb as described. On a longitudinal two-dimensional ultrasonographic image, the far wall of the carotid artery is displayed as two bright white lines separated by a hypoechoic space. The distance from the leading edge of the first bright line (lumen-intima interface) to the leading edge of the second bright line (media-adventitia interface) was identified as the CIMT. The average of the right and left side was calculated and was taken as mean CIMT for analysis. A serum Hcy level of >15 μ mol/L and a CIMT of > 0.8 mm were taken as abnormal. Statistical analysis was done using the statistical software SPSS 16.0. A probability value of less than 0.05 was considered as significant. Hundred (65 males and 35 females) patients were included in the study with a median age of 59.6 years. [Table 1] shows the baseline characteristics of all patients. Type 2 diabetes mellitus (T2DM) was found in 38% patients (26 males and 12 females) and hypertension was found in 61% patients (38 males and 23 females). Twenty-two patients (14 males and 8 females) were previously detected to have dyslipidemia and were on treatment. Twenty-five patients were smokers. Three patients gave a history of a prior coronary event. 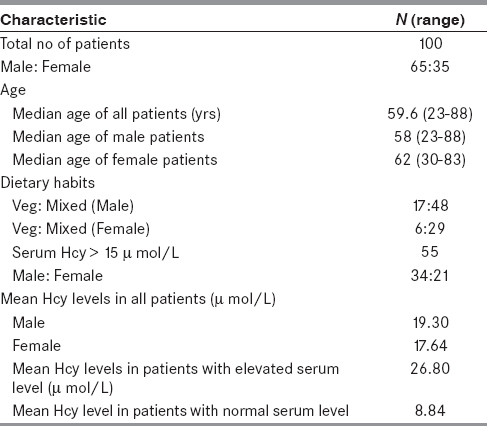 Serum Hcy was found to be elevated in 55 patients (34 males and 21 females) with a mean level of 26.80 μmol/L. The mean serum Hcy in males was 19.30μ mol/L and in females was 17.64 μmol/L. 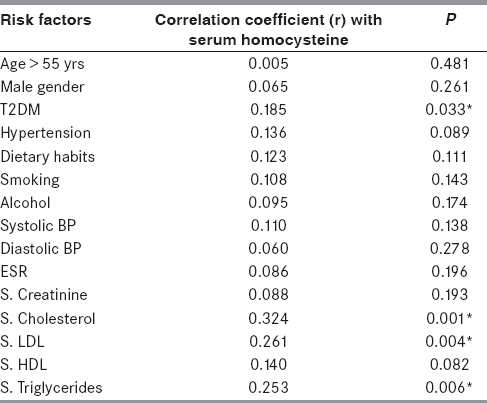 The main factors associated with increased Hcy levels in our study population were serum cholesterol (correlation coefficient r = 0.324, P = 0.001), serum LDL (r = 0.261, P = 0.004), serum triglyceride levels (r = 0.253, P = 0.006) and presence of diabetes (r = 0.185 P = 0.035) [Table 2]. Eighty-six patients (54 males and 32 females) had CIMT > 0.8 mm (mean of all patients -1.022 mm, females -1.0286 mm, males -1.0185 mm). Out of the 55 patients who had an elevated Hcy levels, 51 patients (92.7%) had carotid intima medial thickening. On doing a bivariate correlation, we found that there is a significant correlation between elevated serum Hcy levels and CIMT (r = 0.409, R 2 = 0.362, P = < 0.01) [Figure 1]. The present study aimed to analyze whether there is a correlation between elevated serum Hcy levels and CIMT and to see if Hcy levels independently influence CIMT, which is an established early indicator of systemic atherosclerosis preceding stroke and myocardial infarction. One of the reasons for the discrepancy between Indians and other ethnic groups may be due to the differences in their dietary habits. In India, due to cultural and socio-economic factors, there are many vegetarians who consume a Vitamin B12 deficient diet, thus causing elevated serum Hcy levels. Moreover, among people consuming a mixed diet, the frequency of consumption of non-vegetarian food items is low. On multiple linear regression analysis, with CIMT more than 0.8 mm as the dependent variable, after adjusting for all the other risk factors, serum Hcy levels, ESR and consumption of alcohol were found to be significantly correlated with increased CIMT. Also it was found that variance caused by Hcy level alone on the CIMT is 60.2% (R = 0.602, P = 0.000). Alcohol and serum Hcy levels both combines together to cause a variance of 64.2% in the mean CIMT (R = 0.642, P = 0.000). No studies so far has reported the variance caused in CIMT by Hcy alone or in combination with other risk factors. The finding of elevated Hcy levels in patients with atherothrombotic stroke and a significant association of elevated Hcy levels to CIMT brings to fore the importance of framing strategies for the prevention of atherosclerosis and its complications. Estimation of serum Hcy level holds promise for slowing the progression of atherosclerosis and subsequent morbidity and mortality due to coronary and cerebrovascular diseases by early identification of at risk people. This study is limited by the small sample size and the lack of a control group. Larger population-based studies are needed to further verify the fact of elevated Hcy levels and its causation. This single center study has found out positive correlation between elevated serum Hcy levels and CIMT in stroke patients. Elevations in serum levels of Hcy causes variation of 60% in CIMT when other risk factors are controlled, and so serum Hcy may be considered as an independent risk factor for cerebrovascular disease. McCully KS. Homocysteine and vascular disease. Nat Med 1996;2:386-9. Selhub J, Jacques PF, Bostom AG, D'Agostino RB, Wilson PW, Belanger AJ, et al. Association between plasma homocysteine concentrations and extracranial carotid-artery stenosis. N Engl J Med 1995;332:286-91. Graham IM, Daly LE, Refsum HM, Robinson K, Brattstrom LE, Ueland PM, et al. Plasma homocysteine as a risk factor for vascular disease. The European Concerted Action Project. JAMA 1997;277:1775-81. D'Angelo A, Selhub J. Homocysteine and thrombotic disease. Blood 1997;90:1-11. Thambyrajah J, Townend JN. Homocysteine and atherothrombosis-mechanisms for injury. Eur Heart J 2000;21:967-74. Durga J, Verhoef P, Bots ML, Schouten E. Homocysteine and carotid intima-media thickness: A critical appraisal of the evidence. Atherosclerosis 2004;176:1-19. Adachi H, Hirai Y, Fujiura Y, Matsuoka H, Satoh A, Imaizumi T. Plasma homocysteine levels and atherosclerosis in Japan: Epidemiological study by use of carotid ultrasonography. Stroke 2002;33:2177-81. Ntaios G, Savopoulos C, Hatzitolios A, Ekonomou I, Destanis E, Chryssogonidis I, et al. Homocysteine and carotid intima-media thickness in ischemic stroke patients are not correlated. Neuropsychiatr Dis Treat 2008;4:477-9. Linnebank M, Moskau S, Farmand S, Fliessbach K, Kolsch H, Bos M, et al. Homocysteine and carotid intima-media thickness in a german population: Lack of clinical relevance. Stroke 2006;37:2840-2. Chacko KA. 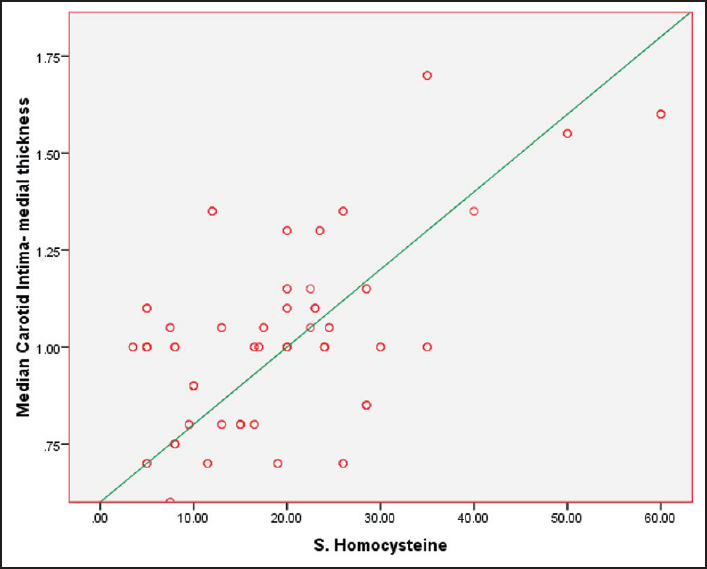 Plasma homocysteine levels in patients with coronary heart disease. Indian Heart J 1998;50:295-9. Obeid OA, Mannan N, Perry G, Iles RA, Boucher BJ. Homocysteine and folate in healthy east London Bangladeshis. Lancet 1998;352:1829-30. Misra A, Vikram NK, Pandey RM, Dwivedi M, Ahmad FU, Luthra K, et al. Hyperhomocysteinemia, and low intakes of folic acid and vitamin B12 in urban North India. Eur J Nutr 2002;41:68-77. Refsum H, Yajnik CS, Gadkari M, Schneede J, Vollset SE, Orning L, et al. Hyperhomocysteinemia and elevated methylmalonic acid indicate a high prevalence of cobalamin deficiency in Asian Indians. Am J Clin Nutr 2001;74:233-41. Gheye S, Lakshmi AV, Krishna TP, Krishnaswamy K. Fibrinogen and homocysteine levels in coronary artery disease. Indian Heart J 1999;51:499-502. Takamura N, Abe Y, Nakazato M, Maeda T, Wada M, Nakashima K, et al. Determinants of plasma homocysteine levels and carotid intima-media thickness in Japanese. Asia Pac J Clin Nutr 2007;16:698-703. Inamoto N, Katsuya T, Kokubo Y, Mannami T, Asai T, Baba S, et al. Association of methylenetetrahydrofolate reductase gene polymorphism with carotid atherosclerosis depending on smoking status in a Japanese general population. Stroke 2003;34:1628-33.